DC crossovers are always a bit of a mixed bag. On one hand, the comic book giant has created some of the world’s most iconic superheroes. On the other hand, many of their properties don’t mesh naturally with the others, whereas Marvel’s series feel more properly linked together. While the latter element of DC crossovers has lead to some disastrously muddled movies in recent times, the idea does fit a bit better into the world of video games. A great example of this is 2013’s Injustice: Gods Among Us, a fighting game built around the DC Universe from the creators of Mortal Kombat. In short, Injustice: Gods Among Us is a really good fighter that uses the DC license to its benefit. It has a wide variety of DC heroes and villains – from the obvious picks like Superman, Batman and the Joker, to relatively obscure choices like Solomon Grundy and Deathstroke (unfortunately my favorite DC villain, The Scarecrow, doesn’t make the playable roster) – as well as some fun, original ideas for the fighting genre. While it’s true that most of the game’s basics will be nothing new to those familiar with the genre – with the game following the tried-and-true format laid down by Street Fighter 2 – Injustice does have a few new tricks up its sleeve. 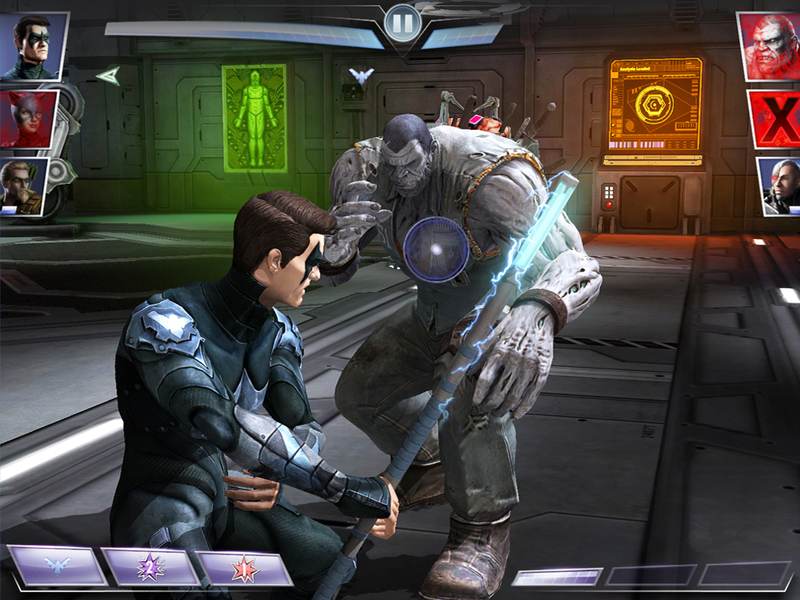 For starters, not only does each character play differently from the others, but many of them have gameplay-altering abilities (Flash, for example, can “speed up” so his opponents move in slow-motion until they land a hit, while Wonder Woman can switch from her fists and whip to a sword and shield). 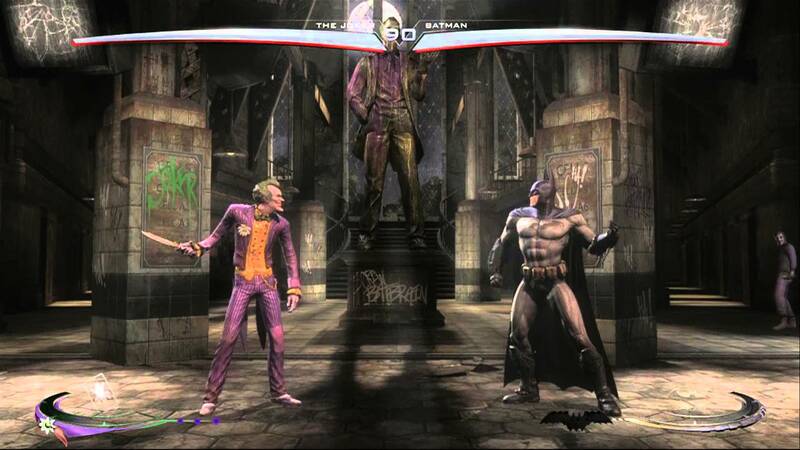 The stages also have interactive elements, which can be used to varying effects depending on the character (Superman might throw a car at his opponent, while the Joker would simply blow it up). Perhaps most notably, the character’s extravagant special moves can be countered in quicktime events, with players waging on a set amount of stored-up power, which can result in taking more damage or even healing a bit of health from blocking the move, depending on how much energy was wagered. These aforementioned special moves are as ridiculous as those from Mortal Kombat, though appropriately less gruesome. Superman takes his opponent into the atmosphere before sending them crashing back down to Earth, The Flash runs around the world to deliver a single, devastating punch, while Aquaman sends a tidal wave crashing down on his enemies and follows it up with vicious sharks. They’re appropriately outlandish, and when combined with the character variety and level features, it makes Injustice a fighter that’s full of surprises. Injustice also has a pretty strong sense of balance, as I haven’t really noticed any characters to have significant advantages or disadvantages with their play styles. Though I do have to admit certain moves are a little too easy to spam repeatedly (I myself have a little too much fun throwing laughing gas canisters as the Joker). The multiplayer modes are what will keep players coming back to Injustice for more, with some additional modes providing some extra fun, but it should be noted that the game features a pretty impressive single player campaign as well. Unlike most fighting games, in which each character has their own campaign and fights a set number of characters with minimal plot, Injustice: Gods Among Us instead has a singular, cinematic story that spans twelve “chapters,” each one starring a different character. The plot sees a number of Earth’s heroes, such as Batman, Wonder Woman, Green Lantern, Green Arrow and Aquaman, as well as the Joker, mysteriously teleported to another dimension. In this alternate world, Joker had managed to temporarily poison Superman’s mind, with the Man of Steel then destroying all of Metropolis and all who lived there during his manipulation, including his own family. Overrun with grief, Superman murdered the Joker and conquered the Earth, to ensure order under his newfound dictatorial delusions. Any heroes who oppose Superman’s new regime are killed, with the exception of Batman, who has created a resistance and brought the heroes from the more traditional timeline to help aide him in bringing down Superman’s rule. It is a pretty fun story that introduces some good concepts, like an alternate Lex Luthor, who is a law abiding citizen working undercover with Batman to help end Superman’s regime, and even a few quicktime events before certain fights, to determine whether you start the match with an advantage or disadvantage. But the story isn’t without its flaws in both narrative and gameplay. For starters, each chapter is composed of four fights. That may not sound like much of a problem, but after the first few chapters, it becomes incredibly formulaic, and just feels like a means to pad things out. You may even roll your eyes at how frequently the current character conveniently runs into exactly two opponents to be fought in succession in one segment of their story, and then conveniently bumps into two more soon after. You can’t help but feel that some chapters would have been better with either more or less to them, instead of following its four fights rule to such an obsessive-compulsive extent. Another downside is that the story can get a little silly, despite presenting itself as dead serious. The number of times the plot rapidly jumps around just to be sure to include specific characters is a bit pandering, and much of the plot’s focus between the different dimensions comes off as fanfictiony gobbledygook. On the bright side, it’s never as muddled as Batman V. Superman, and it’s certainly a lot more fun, but the serious tone often clashes with the rather ridiculous goings-on within the story. With all that said, Injustice: Gods Among Us is still one of the better fighting games released in recent years. It has a sense of variety and polish that, frankly, the Mortal Kombat games themselves don’t have. And as far as I’m concerned, any excuse to have Batman characters beat Superman to a pulp is a good one. I had been interested in this kind of game. I feel Marvel gets all the fighting love because of the Marvel vs. series, so it’s actually fresh to have DC fighting. I’m glad it’s pretty good and similar to Mortal Kombat, possibly better. I’d heard of a DC vs. Mortal Kombat game last generation too, so I wonder how that is.